Like previous years, I'll write a "live" Conference Report on this website including details of all major events, Borland and 3rd-party announcements and session details. My personal focus will be on Delphi (for .NET) and C#Builder, but I also look for any news on C++Builder, Kylix, as well as other new developments. 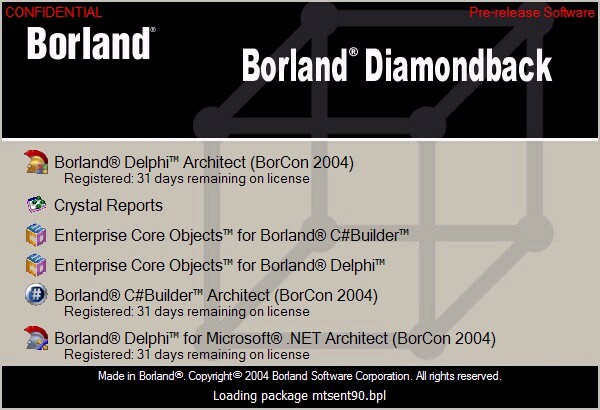 BorCon 2004 will be the first public showing anywhere of DiamondBack (the code name for the next version of Delphi). BorCon will be the first place to learn all the exciting new features coming in Diamondback, as reported on the Borland Developer Network. I've arrived in San Jose on Saturday night (after a 24+ hour trip via Cincinatti), and have already seen/spoken to a lot of people here (it's like the annual get-together of Borland developers - you always feel right at home). There were already some pre-conference tutorials today (which I missed, obviously) including Danny Thorpe on .NET 2.0 (which was covered "live" by Nick Hodges' blog) and John Kaster on Diamondback. More links to BorCon blogs below. Today, I attended the Janeva pre-conference tutorial by Gerard van der Pol, to see how Janeva works with JBuilder and J2EE. Although I haven't used JBuilder myself in years, it was a very interesting tutorial indeed. For my own Janeva sessions (on Tuesday and Wednesday) I will only demonstrate the connection to (Delphi 7) CORBA Servers with Janeva, from C#Builder .NET clients. I'm just back from the Opening Keynote and Welcome Reception. The keynote started with an agile workout by DavidI, followed by a video on the new theme "unleash the power". It was the first time that DavidI's mom and sister were also present at BorCon, by the way. After some general conference news, DavidI introduced Dale Fuller who came on stage for his 6th BorCon (it all started for him at BorCon 1999 in Philadelphia). At his first BorCon, Dale made some promises to developers. And this time he also assured us that Borland will never abandon developers. A new acronym was introduced as well (at least I hadn't heard it before): SDO - Software Delivery Optimisation. Even for this, code is key ("everything else is waste" - those were Dale's exact words). Although Diamondback is used by some speakers in their pre-conference tutorials and sessions, the official preview of Diamondback will be on Monday evening at 20:00, right before the Meet the [Delphi] Team session. However, Dale didn't want to wait until Monday night to show Diamondback, so they previewed a little DavidI-made music video that showed some features of Diamondback in action. Although the video was a bit blurry at times, we could see some new features (at the end of the video DavidI also mentioned what we could have seen). First of all, we saw some Refactoring menu entries, as well as a scene where typing in one place (renaming an identifier, from the looks of it) also made changes in other places where that identifier was used (within a selected section of code). I'm not sure if that's actually refactoring, or "sync edit" (as Craig Stuntz calls it). We also saw an extension of Code Insight, where you not only get the little pop-up window that lists the possible fields, methods or whatever, but also - for the currently selected item in that list - some additional help that explains what that particular property, method or argument is used for. This was referred to as Help Insight. Another very interesting snapshot was taken of an ASP.NET deployment menu option, that resulted in a dialog or designer where you could specify files to deploy (on the left side) and also get an actual view of the deployment site (on the right side). This would be a very cool way to deploy, update and maintain your ASP.NET applications from within the IDE, that's for sure. Tomorrow, we'll get actual demos of Diamondback, not just a video of a screen embedded in an MTV music video. After the Diamondback video, Dale went on to tell us that Borland has had 18 quarters of profitability in a row (he jokingly added that the company has had 19 of such quarters in total - at least I hope/think he was joking). His keynote went on to mention some figures about projects that are never completed (about one third of all projects that start), and projects that complete but over budget. The emphasize was on change management. Not from the top side down, but from the code side up. Again, the code is central (for Borland), and the development tools have all been extended with ALM capabilities and/or integrations (not the other way around, producing case tools that spit out code). SDO (the Software Delivery Optimisation) was specified as ERP for Software. Then, CTO Pat Kirpin (sp) came on stage to give a demonstration of a concept/idea that they are thinking about (or literally playing with) at Borland. It involved a very visual representation of work, workflow and team cooperation, where you could manage people, projects and workflow. As a funny reference to earlier BorCons, one of the example projects was "Blue Dwarf"
After that, it was time for the annual awards (which will most likely be mentioned again on Borland's website tomorrow), including the President's Award to Allen Bauer (congratulations!). The end of the keynote featured Dale using his air-canon again to shoot T-shirts in the audience. According to DavidI (while ducking for his live), this was a "live" demonstration of Software Delivery Optimisation at BorCon. The general session this morning started with drummers on stage (the San Jose Taiko), with DavidI joining them at the end for an impressive act of teamwork. After DavidI explained the relevance (it was done to chase insects - bugs, install fear in enemies - competitors), including the collective spirit, or teamwork again. 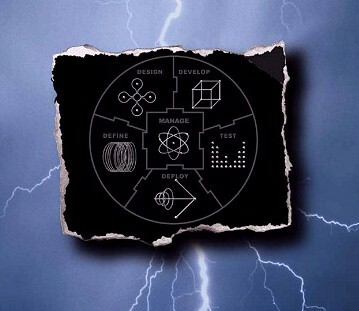 In this light, Software Delivery Optimization is about deriving business value from software. Using a virtual ipat.com webstore, and some "change requests", Boz then demonstrated how SDO is done today. Several people - in different chains of the development process - would come up to stage and get (automatically) notified about the change, showing a lot of the ALM tools like StarTeam, CaliberRM (the few that I recognised) and Together in combination with JBuilder. The interaction on stage felt very close to real life (although the example itself was a bit artificial), and well received. Themis: Teamwork Foundation (of ALM tools), with 4 roles (analyst, architect, developer, tester), which is being worked on for a year now, and can be delivered in Q1 2005. Hyperion: Portal/Process Enablement, about visibility and predictibility. Prometheus: ERP for Software Delivery. He then went on to announce JBuilder 2005, StarTeam 2005, and CaliberRM 2005 (like cars, it seems to be normal to announce next years model today). At the end of the session, Rick Nadler and Michael Swindell came onto stage to give a quick demo of JBuiler 2005 (and the embedded CaliberRM client, distributed refactoring and security audits) and Diamondback (with unit testing, to bring the developer and tester closer together). Monday evening was the main event for many (Delphi) developers: the Diamondback Preview, and Meet The (Delphi) Team. We were not disappointed, I can tell you that! Michael Swindell started the session with an announcement regarding Kylix, namely the Kylix Community Project (with both Michael Swindell and Allen Bauer from Borland involved, and people like Chad Z. Hower, Andreas Hausladen, Olaf Monien, and Charlie Calvert as well as yours truly associated to it). The purpose is to improve Kylix and CLX, support newer versions of Linux distributions, etc. We shouldn't expect new features (I think), but better compatibility with news distros. John Kaster is working with Chad Hower and the other guys on providing more information on this, which will be made available on BND some time next week (hopefully, if everything goes well, nothing else comes up, etc.). We then had the annual Spirit of Delphi award, which this year was won by Nick Hodges. MIDAS for Win32, BDP for ADO.NET, and now also dbGo for both Win32 and .NET. Then the members of the R&D Team came up on stage and gave short demonstrations of the new features (very cool). One specific highlight - for me - include the multi unit namespace functionality (where the left side of the unitname is the namespace, and the right side just adds to the name of the unit). The actual Meet The Team was outside of the room, were everyone also received a CD with the preview version of Diamondback (even cooler than the conference rooms themselves - which are chilly ;-). Latest News: e-mails have been sent out by Borland (to registered users, I guess) with the URL of a 14 min. 39 sec. Diamondback preview!! It was a good meeting, and I'm pleased by the fact that the team was very open to us about C++Builder, C++BuilderX and the "forces of nature" (or Powers-That-Be) that influence their future. Paul Gustavson has a very good coverage of this meeting. The summary: between now and December 15th (this year! ), Borland will decide if it's feasible to put a C++(Builder) personality into a future version of BDS (which is what I mentioned some time ago, having Delphi, Delphi for .NET, C# and C++ all in one IDE!). I've written a more detailed (public) article about this meeting for the C++Builder Developer's Journal, which should be available shortly. Apart from two more sessions today (I had six in total! ), today I decided to spend some time in the exhibition area. One of the upcoming tools that impressed me most was CodeHealer for Delphi from Sock Software (made by Jud Cole, which I knew before in his Blinker-period). CodeHealer for Delphi is a source code analysis and verification tool, which is also highly configurable (if they can implement all my wishes, it will be even more configurable). CodeHealer for Delphi can be used to locate errors in your source code, and improve the style, consistency and overall quality (and maintainability) of your source code. Check it out! This webpage © 2004-2015 by Bob Swart (aka Dr.Bob - www.drbob42.com). All Rights Reserved.